Scorpions are dangerous creatures in Arizona and around the world. Their stings are incredibly painful. For pets, the elderly, children, and those who are allergic to scorpion venom, a scorpion sting could potentially be dangerous or even deadly. Scorpion control is very important and should be administered immediately after finding a scorpion of any type or size in your home. Scorpion home sealing is also an option as well and can prevent additional scorpions from getting within the walls of your home and infesting the building. But what exactly are scorpions, what makes them so dangerous, and what types of scorpions should a homeowner look out for? Read on to educate yourself about scorpions and how to deal with them safely. The scorpion is a predatory arachnid (that’s right– the same class as spiders) of the order Scorpiones. Scorpions have eight legs, a pair of grasping appendages (pincers), and a long, curled tailed that ends in a venomous stinger. Scorpions can vary widely from a tiny nine millimeters to nearly nine inches. Scorpions are a relatively archaic and ancient type of animal that remains to this day. There are nearly 1750 species of scorpions around the world that can be found on nearly every continent. Scorpions stings a exceptionally painful, but in most cases cause little harm to humans. Treatment for a scorpion sting is usually not needed. However, while healthy adults are usually safe, children and elderly adults are at a higher risk for complications from an untreated scorpion sting. In the United States, Arizona included, most of the species of scorpion that reside here are not poisonous enough for healthy people to be considered dangerous, but species of scorpions from other places can in fact be deadly. Regardless, scorpion control and scorpion home sealing should still be considered wherever you may live if you begin to find scorpions in your home. Before you can treat your home to prevent or exterminate scorpions, it is helpful to know exactly what type of scorpion is invading your home. Arizona Bark Scorpions are the most venomous scorpion in North America and reside right here in Arizona. Cases of Arizona Bark Scorpion stings are very common in Phoenix and other parts of Arizona, with estimated thousands of cases each year. Arizona Bark Scorpions are recognizable by their pale yellow, brownish color. Arizona Bark Scorpions range in size from about an in to an inch and a half in length. The Striped-Tailed Wood scorpion is another Arizona native scorpion that is also known as the Arizona Devil or Wood Scorpion. These scorpions are fairly large, and can be two inches in length or even larger. The Striped-Tailed Wood Scorpion pesters residents in Arizona, New Mexico, Mexico, and California. They are recognizable by their dark brownish tan color and noticeably thicker and bulkier bodies. Striped Bark Scorpions are the most common type of scorpion in the United States. Striped Bark Scorpions are usually smaller than Arizona Bark Scorpion, but can still reach lengths as long as an inch and a half. The sting of a Striped Bark Scorpion is often compared to the painful sting of an aggressive wasp and the pain from their venom can last for hours. The powerful sting of the Striped Bark Scorpion may be exceptionally painful, but healthy adults are rarely in danger of needing medical attention. Striped Bark Scorpions are distinguishable by their orange and brown body color and a black striped that run vertically down their backs. The Arizona scorpion known as the Giant Desert Hairy Scorpion is the largest scorpion in the United States. Their name is accurate– these scorpions are quite hairy, similar to a tarantula. No other scorpion in the United States has this unique feature. The Giant Desert Hairy Scorpion is a dark yellowish color and appears greenish in light. The Arizona Giant Hairy Scorpion usually burrows and remains in saguaro cactus forests, but can sometimes be a startling new guest in your home. The Arizona Giant Hairy Scorpion can be over four inches in length and have bulky bodies. The Yellow Ground Scorpion is yellowish in color and has a slender body and legs. Similar to the Arizona Bark Scorpion, the Yellow Ground Scorpion has wider front metasomal segments on its body. The Yellow Ground Scorpion is often reserved for the Sonoran desert, but sometimes can be found in residential areas. Should I try exterminating scorpions in my home on my own? There are several reasons why you should leave the exterminating to the professionals. Most of all, scorpions can be potentially dangerous foes to fight on your own. Attempting to take care of the problem yourself will often not work out, leaving scorpions more time to infest your home and potentially harm any pets, children, or elderly family you may have living inside your home. Just as well, professional exterminators like the pest control specialists at Varsity Termite and Pest Control have the expertise, experience, tools, and products to properly get rid of a scorpion infestation and prevent further intruders from getting into your home. Who can help me with my scorpion problem in my Arizona home? 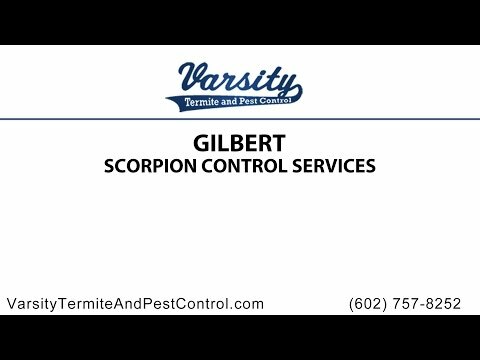 If you need excellent Gilbert pest control of any kind, including scorpion control in Gilbert, Varsity Termite and Pest Control is the place to go. Family owned and operated for over twenty years, Varsity Termite and Pest Control has a team of talented, trained, and expert exterminators that offer scorpion control and scorpion home sealing services to protect your family and pets from the dangers of scorpion infestation. Give us a call today to learn more about our services and how we can help you keep your home pest free for good.